As I mentioned in the last post, everything here has settled into a routine from a personal standpoint, and on that end there is not much to write about. However, there were three things that broke up the monotony. First, as always, the scenery was beautiful. Snow covered hills shield the cove from the winds. Look how smooth the ocean is! The view off the back of the ship. Second, I found out that even with all of the modern equipment on board, catching fish is still not guaranteed. We trawled three times last night on the 23rd and caught a total of 14 fish in all three trawls! 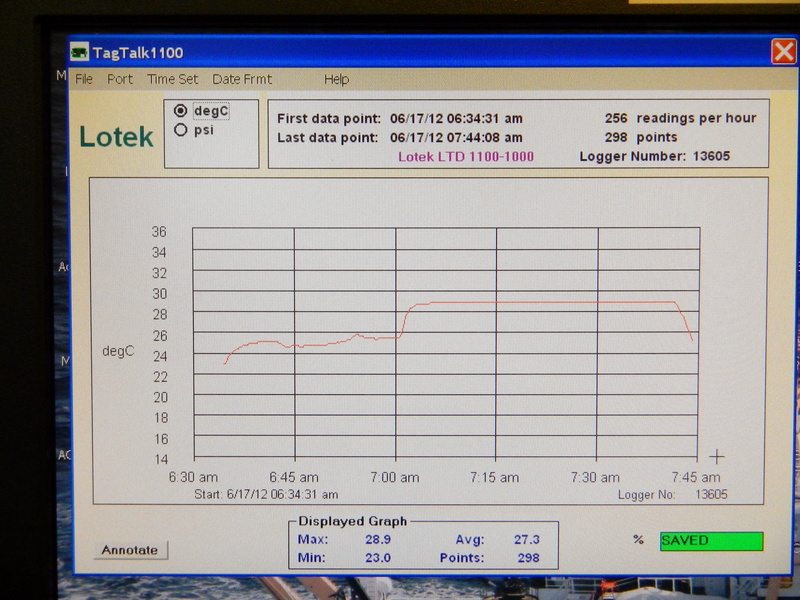 Remember, a good sample size for one trawl is supposed to be 300 pollock, so this is the equivalent of fishing all day long and catching a minnow that just happened to swim into the fishing hook. 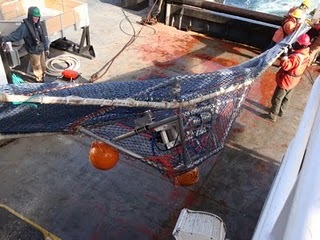 The first trawl caught absolutely nothing, as the fish dove underneath the net to escape the danger. 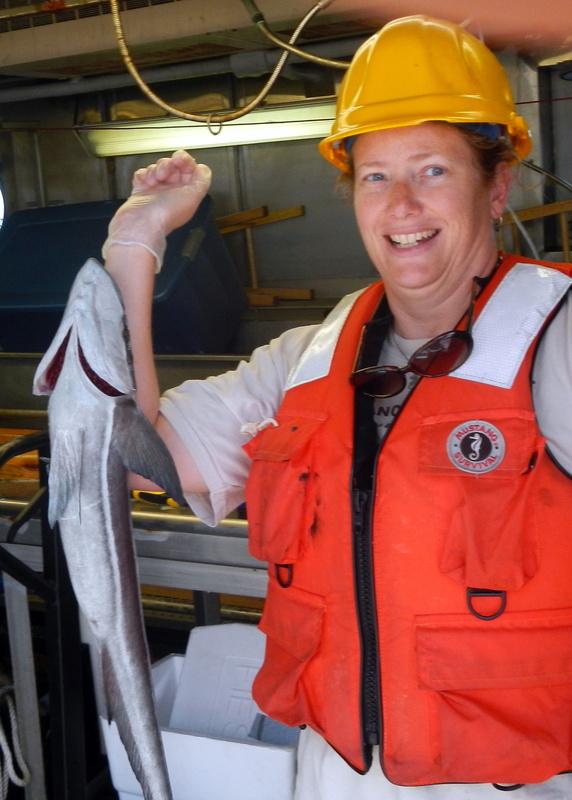 The second trawl caught two pacific ocean perch and one pollock, and the third trawl caught eleven pollock. All in all, not the best fishing day. The lone pollock from the second trawl. Despite the poor fishing, we did bring up this neat little critter. 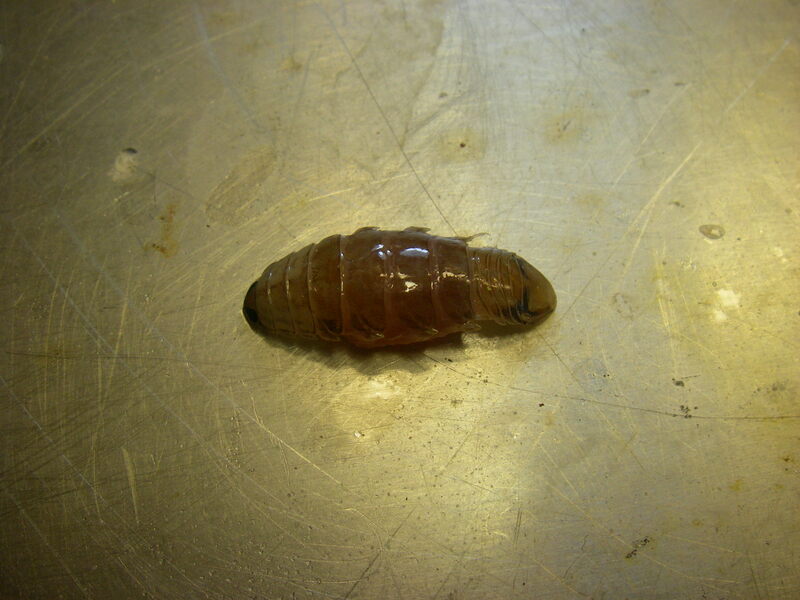 This is an isopod! These animals are very similar to the pillbugs (roly-polys) that we find in the US. 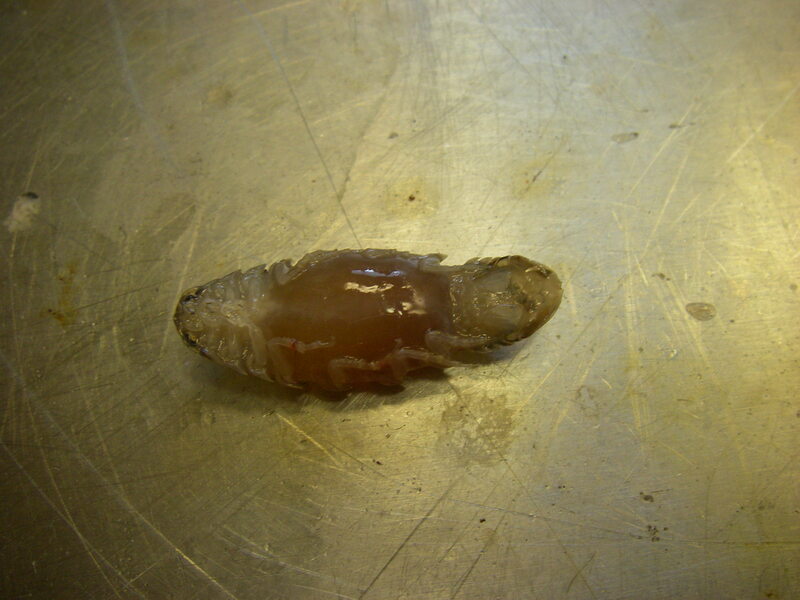 Many marine isopods are parasites, and can be a danger to fish! The third thing to break up the monotony was the Aleutian Islands earthquake. 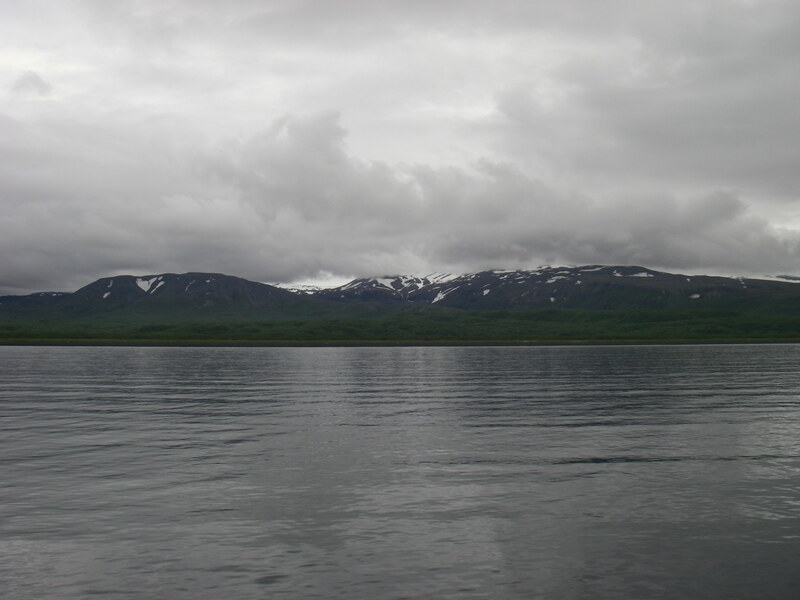 On the evening of June 23rd, a magnitude 7.2 earthquake shook the Aleutian Islands. According to ABC news, the earthquake was centered about 1,200 miles southwest of Anchorage. The quake spawned a brief tsunami warning that caused a large number of Dutch Harbor residents (Dutch Harbor is the home base of the show Deadliest Catch) to head for higher ground. We had been in the Aleutian Islands and Dutch Harbor area on our survey route, but had left two days before, so the Oscar Dysonwas completely unaffected by the earthquake. 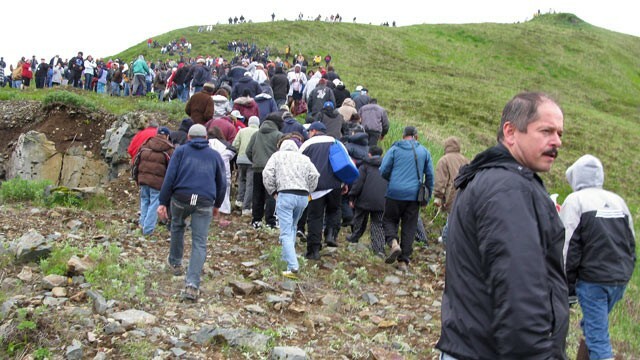 Dutch Harbor residents seek higher ground after a tsunami warning was issued. AP photo by Jim Paulin. 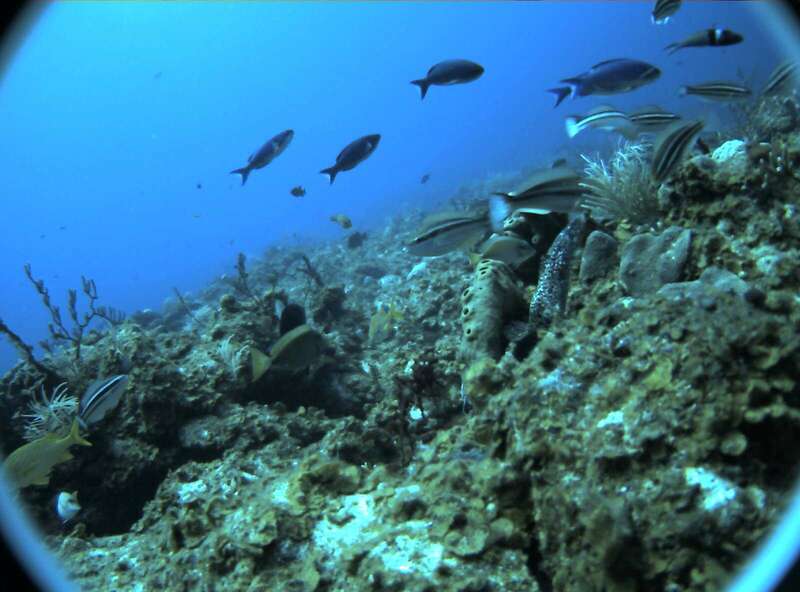 In order to obtain photos of all of this neat sealife, we first have to catch it! We catch fish by trawling for them. Some of you may not know exactly what I’m talking about, so let me explain. 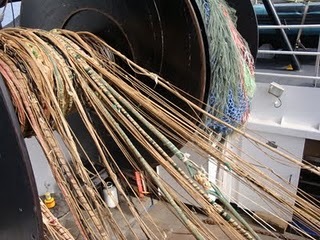 Trawling is a fishing method that pulls a long mesh net behind a boat in order to collect fish. 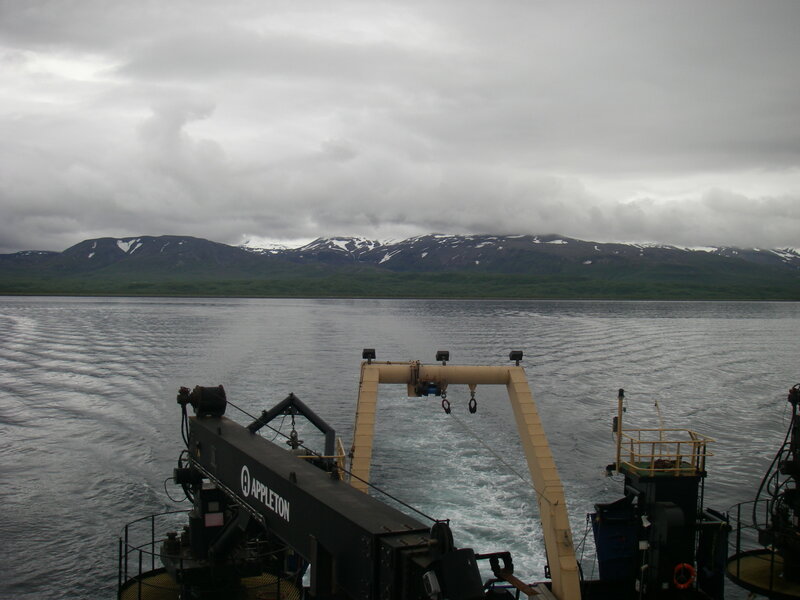 Trawling is used to collect fish for both scientific purposes (like we’re doing) and also in commercial fishing operations. 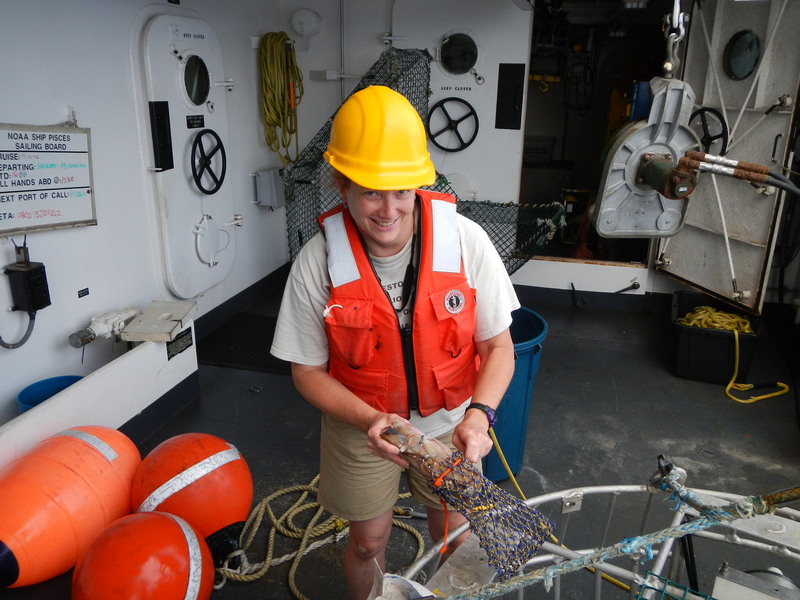 We have two types of fish trawls onboard the NOAA Ship Oscar Dyson — a mid-water trawl net and a bottom trawl net. 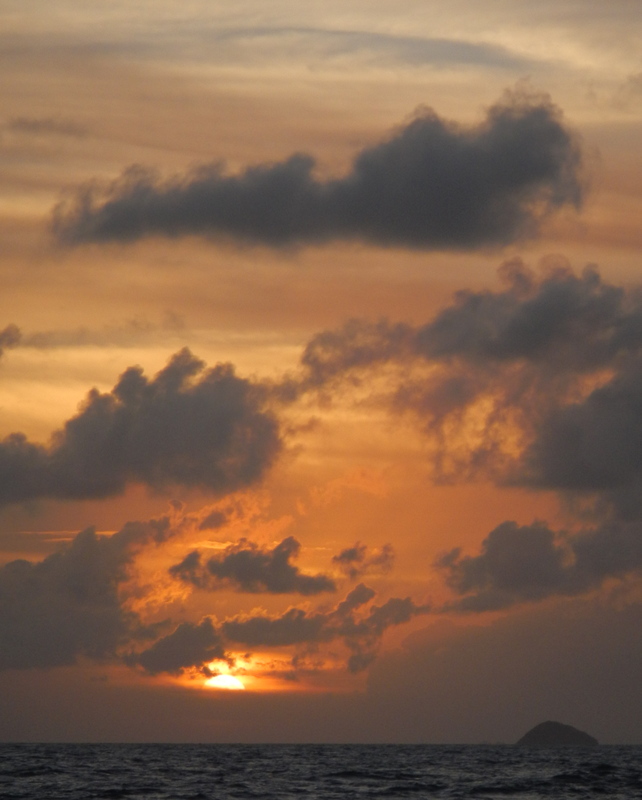 We’ve used both types throughout our cruise, so let me tell you a little about each. 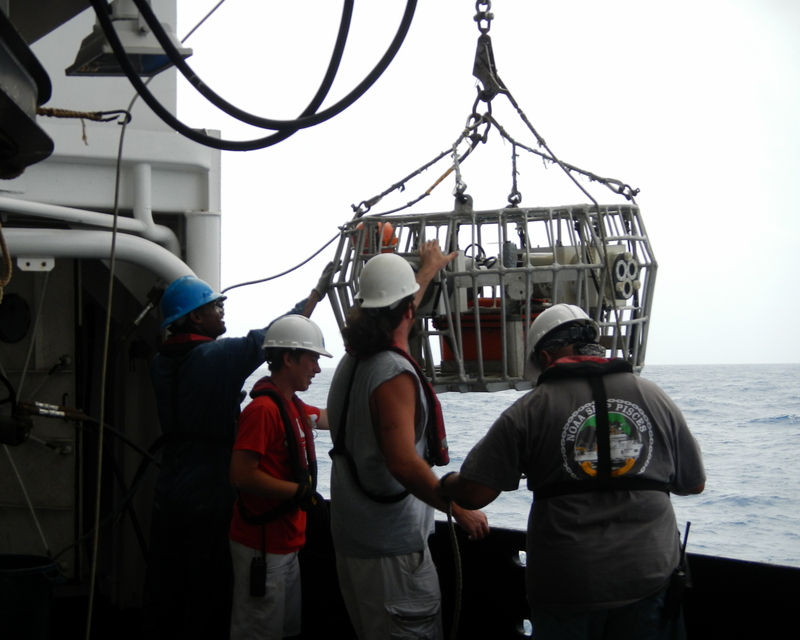 The mid-water trawl net is just as it sounds — it collects fish from the middle of the water column — not those that live on the seafloor, not those that live at the surface. 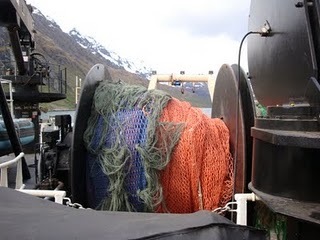 The technical name for the net we have is an Aleutian Wing Trawl (AWT) — it’s commonly used by the commercial fishing industry. 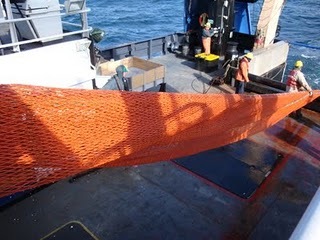 Part of the mid-water trawl net as it's being deployed. 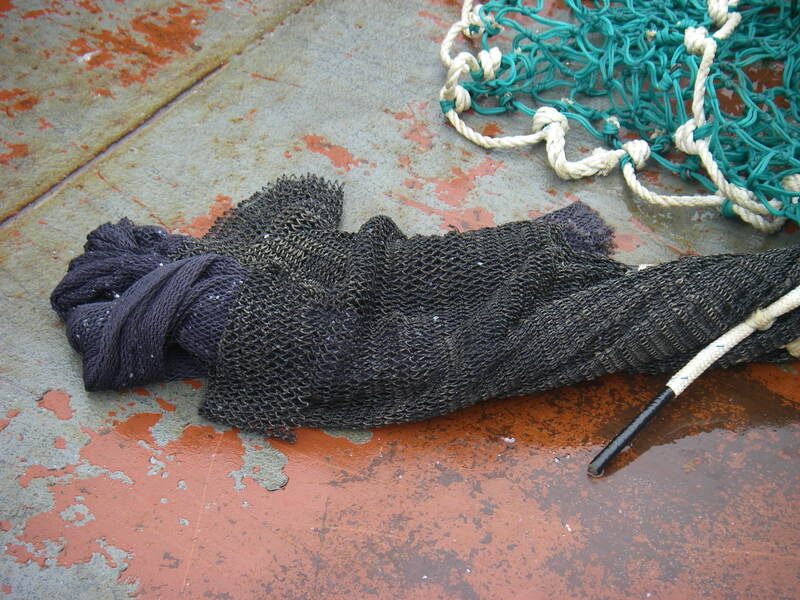 The end of the net where the fish first enter has very large mesh, which is used to corral the fish and push them towards the bag at the end. The mesh gets progressively smaller and smaller the further into it you go, and at the very end (where the collecting bag is), the mesh size is 0.5 inches. The end (where the bag is, or where the fish are actually collected) is called the codend. 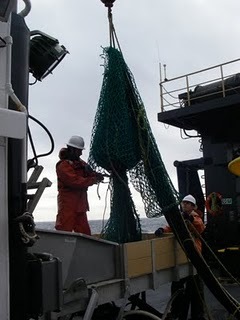 This is the kind of net we use when we want to collect a pollock sample, because pollock are found in the water column, as opposed to right on the seafloor (in other words, pollock aren’t benthic animals). Our particular net is also modified a little from a “normal” AWT. 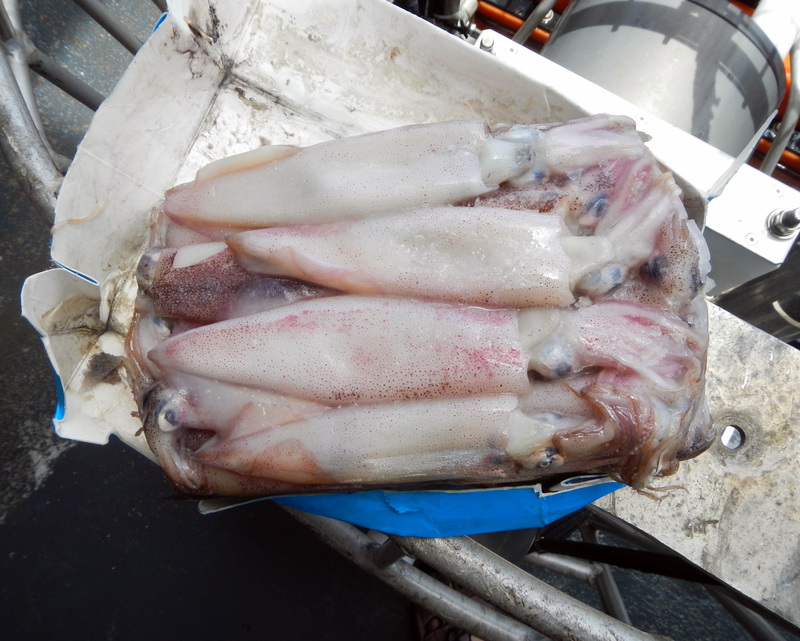 Our trawl has three codends (collecting bags) on it, each of which can be opened and closed with a switch that is controlled onboard the ship. The mechanism that opens and closes each of the 3 codends is called the Multiple Opening and Closing Codend (MOCC) device. 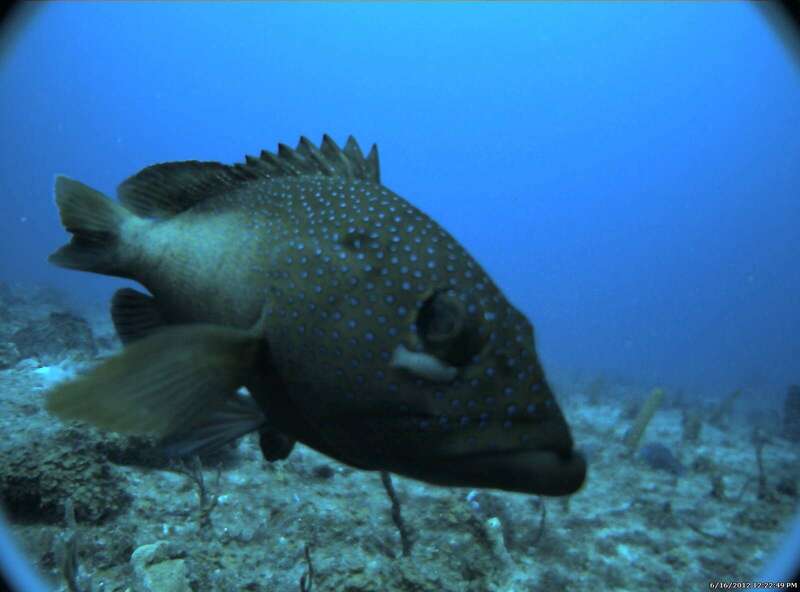 Using the MOCC gives us the ability to obtain 3 discrete samples of fish, which can then be processed in the fish lab. 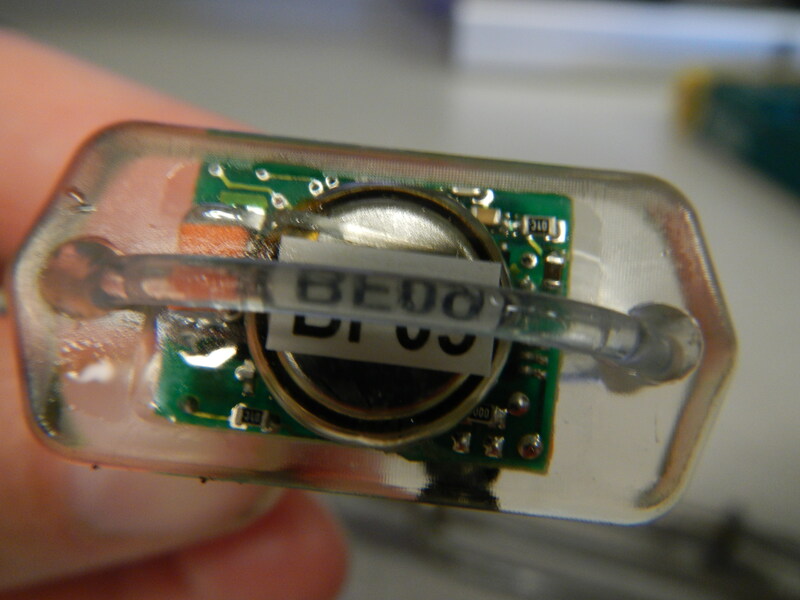 The MOCC apparatus, with the 3 nets extending off. 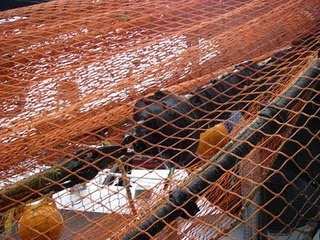 The nets are opened and closed using a series of metal bars. 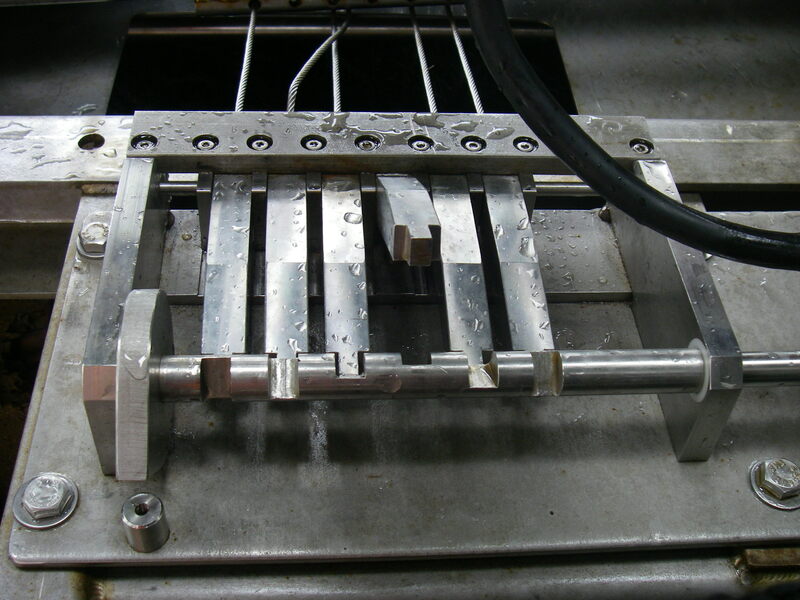 (The bar here is the piece of metal running across the middle of the photo). The net has 6 of these bars. 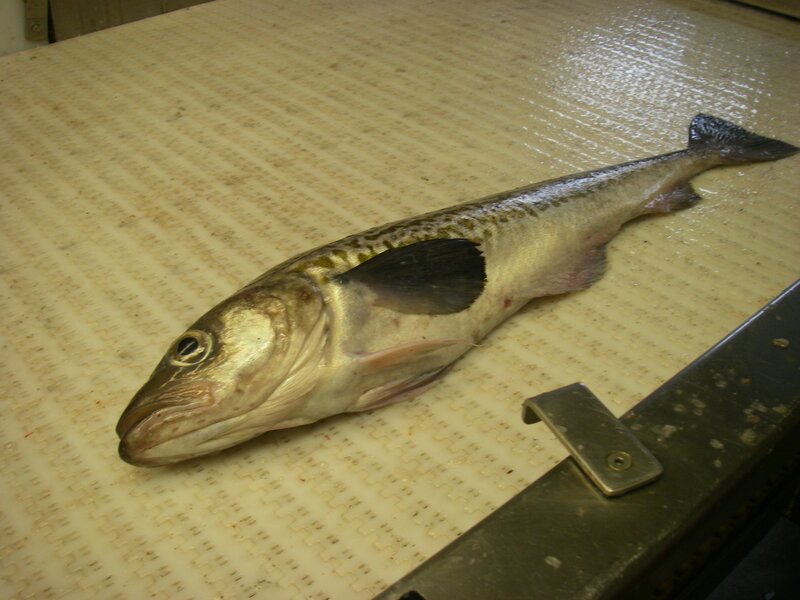 When the first bar is released, the first codend is ready to take in fish. When the second bar is dropped, the first codend is closed. The third and fourth bars open and close the second codend, and the fifth and sixth bars open and close the third codend. This is the trigger mechanism for the codends on the MOCC. When the codend is released, the trigger mechanism is up. When the codend is locked and ready to go, it is in the down position. 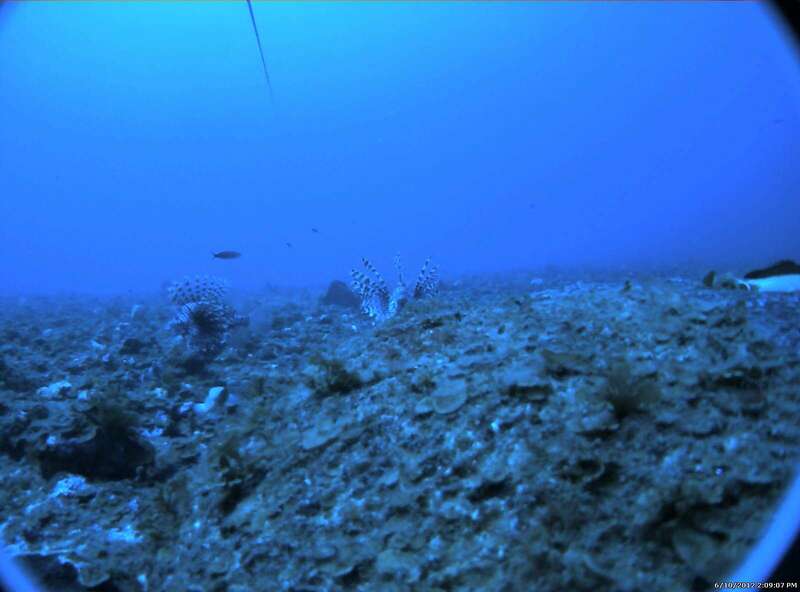 One other modification we have on our mid-water trawl net is the attachment of a video camera to the net, so we can actually see the fish that are going into the codends. 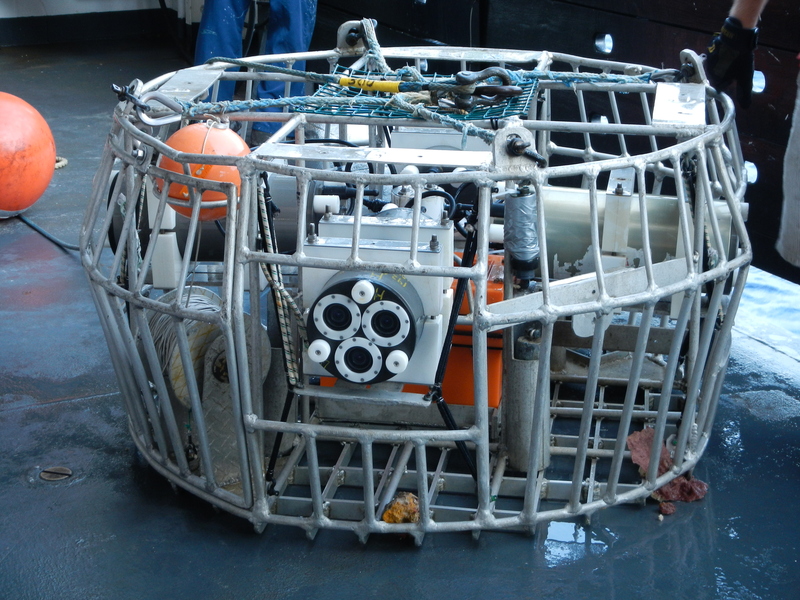 This is the camera apparatus hooked up to the trawl. When we spot a school of fish on the acoustic displays, we then radio the bridge (where the captain is) and the deck (where the fishermen are) to let them know that we’d like to fish in a certain spot. 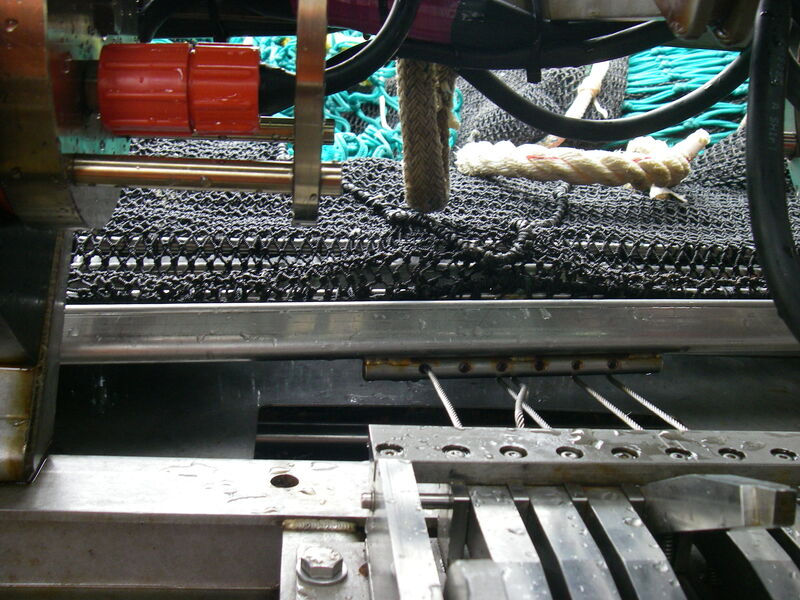 The fishermen that are in charge of deploying the net can mechanically control how deep the net goes using hydraulic gears, and the depth that we fish at varies at each sampling location. Once the gear is deployed, it stays in the water for an amount of time determined by the amount of fish in the area, and then the fishermen begin to reel in the net. See the videos below to get an idea of how long the trawl nets are — they’re being reeled in the videos. 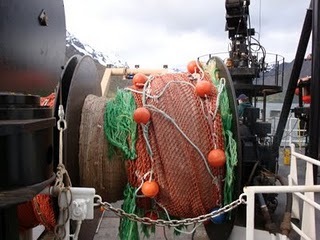 Once all of the net (it’s VERY long — over 500 ft) is reeled back in, the fish in the codends are unloaded onto a big table on the deck using a crane. 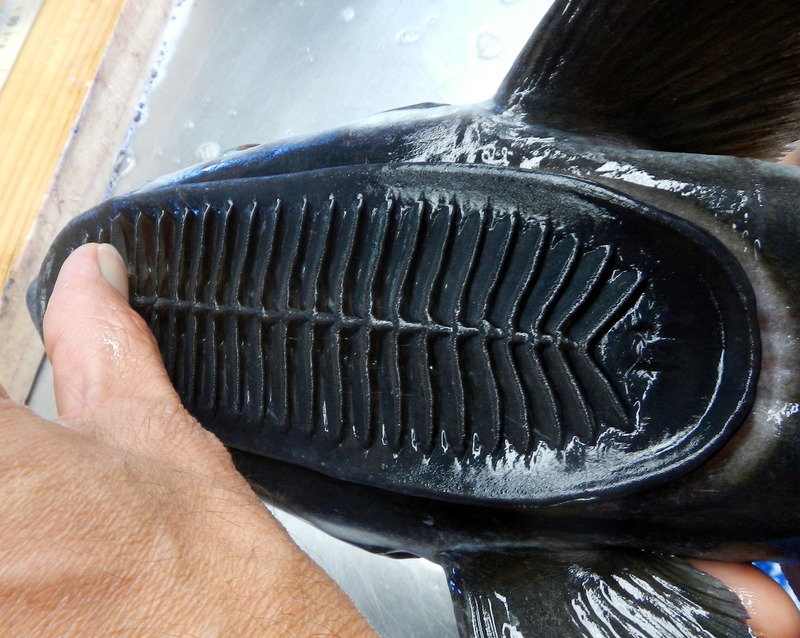 From there, the fish move into the lab and we begin processing them. Videos of the net being reeled in and additional photos are below! 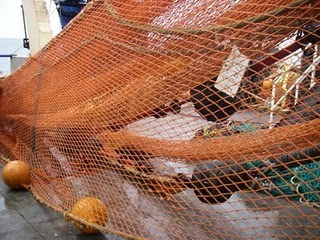 This is the end of the trawl net. They are lines that basically hold onto the net. One of the codends before being opened up onto the conveyor belt. We are inside waiting for the fish to arrive. Opening the codend to release the fish catch! 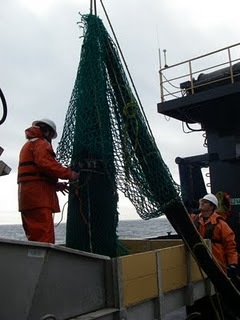 The mid-water trawl net all reeled in! 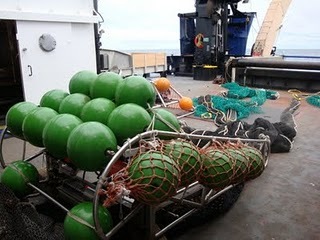 The mesh and wheels of the bottom trawl. The bottom trawl, all reeled in! The first question for today comes from Rich, Wanda, and Ryan Ellis! Ryan is in the homeschool Tuesday class at the Zoo. Q. We looked up what an anemone was and we found it was some kind of plant. Is that correct? A. Great question! The answer is both yes and no. 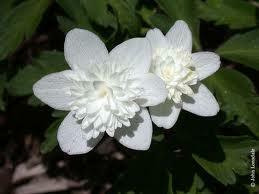 There is a type of flowering plant called the anemone. There are about 120 different species, and they are in the buttercup family. For one example of the plant, look below! The sea anemone, however, is not actually a plant but an animal! Anemones are classified as cnidarians, which are animals that have specialized cells for capturing prey! In anemones, these are called nematocysts, which have toxin and a harpoon like structure to deliver the toxin. When the nematocysts are touched, the harpoon structure injects the toxin into the animal that touches it. 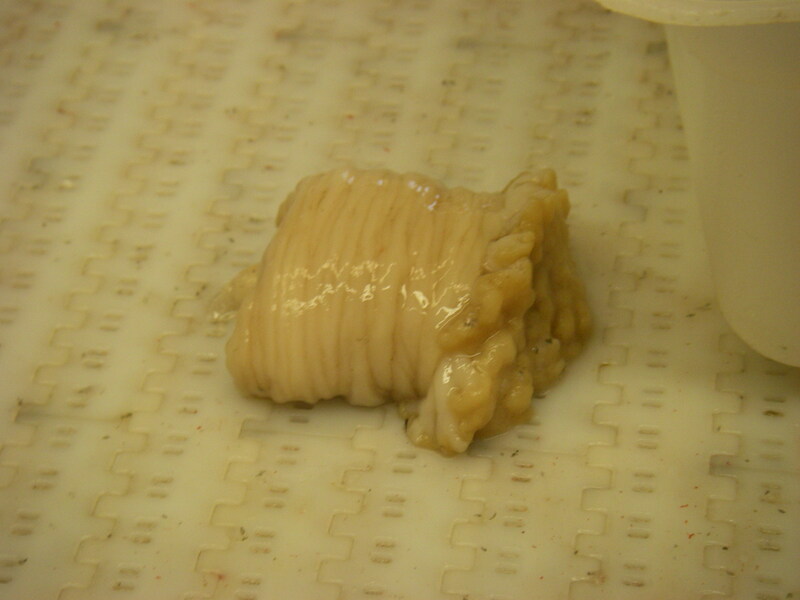 Cnidarians also have bodies consist of mesoglea, a non living jelly like substance. They generally have a mouth that is surrounded by the tentacles mentioned above. The second question comes from my wife Olivia. Q. What has surprised you most about this trip? Any unexpected or odd situations? A. I think the thing that has surprised me the most is the amount of down time I have had. When I came on, I assumed that it would be physical and intense, like the show Deadliest Catch, where I would spend my whole time fishing and then working on the science. I figured that I would be absolutely toast by the end of my shift. While I have worked hard and learned a lot, I have quite a bit of down time. Processing a catch takes about one hour, and we fish on average once or twice a night. That means I am processing fish for roughly two hours at most, and my shift is twelve hours. I have gotten a fair amount of extra work done, as well as a lot of pleasure reading and movie watching. As for unexpected and odd situations, I didn’t really expect to get your camera killed by a wave. Fortunately, I have been allowed to use the scientist camera, and have been able to scavenge photos from other cameras, so I will still have plenty of pictures. Another technological oddball that I didn’t think about beforehand was that certain headings (mainly if we are going north) will cut off the internet, which is normally fantastic. It is frustrating to have a photo 90% downloaded only to have the ship change vectors, head north, and cut off the download, forcing me to redownload the whole photo. I also didn’t expect that the fish would be able to dodge the trawl net as effectively as they have. We have had four or five “misses” so far because the fish will not stay in one spot and let us catch them. While the use of sonar and acoustics has greatly improved our ability to catch fish, catching fish is by no means assured. Perhaps the biggest “Are you kidding me?” moment though, comes from James and David Segrest asking me about sharks (June 17-18 post). An hour after I read the question, we trawled for the first time of the trip, and naturally the first thing we caught was the sleeper shark. Also naturally, I haven’t seen a shark since. Sometimes, you just get lucky.